Rejuvenated Medical Spa in Fayetteville, AR specializes in CoolSculpting, the world’s #1 non-invasive fat-reduction procedure. This breakthrough fat-freezing technology targets stubborn pockets of fat in most areas of the body without incisions or injections, creating a more contoured appearance without downtime. With more than 7 million CoolSculpting treatments worldwide, people are getting a better view of themselves, thanks to the one-of-a-kind CoolSculpting procedure. Coolsculpting is an FDA-cleared procedure that uses cooling and freezing to remove stubborn fat-deposits. Cost-effective and 100% non-surgical, the clinic-based treatments last under two hours. In the U.S., Coolsculpting is government-cleared for nine FDA treatment areas. Unlike other treatments, CoolSculpting permanently eliminates fat cells. 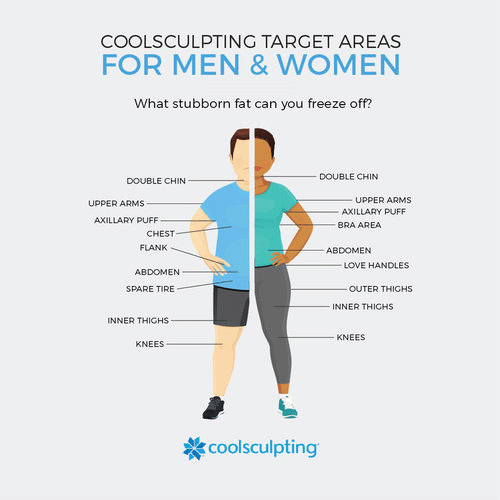 Coolsculpting isolates and crystallizes fat cells, using a process called “Cryolipolysis.” Since fat has a higher freezing temperature, it can destroy fat without damaging other areas of the body. Over time, the body naturally removes dead cells, leaving the treatment area more toned and sculpted. To date, more than 7 million Coolsculpting procedures have been performed worldwide.